Lambaste the obsequious and banal with the trenchant fusillades you create with your Genius Kit. 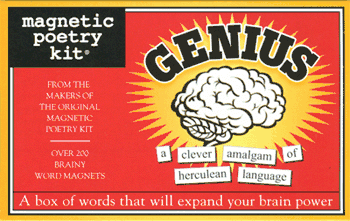 This brainy collection of over 200 words allows you to show the world your smarts. And don't worry--the kit comes with a mini-dictionary in case you momentarily forget the definition of "obsequious" or "trenchant." Other words in the kit include obdurate, caterwaul, amalgam, and unctuous.